Concept art for “The Liberator”, a miniseries written and produced by visiting Communications prof. Jeb Stuart (pictured in the inset). With blockbuster hits like “The Fugitive” and “Die Hard” under his belt, it only made sense for visiting Communication Prof. Jeb Stuart’s recent miniseries, “The Liberator,” to be picked up by Netflix. 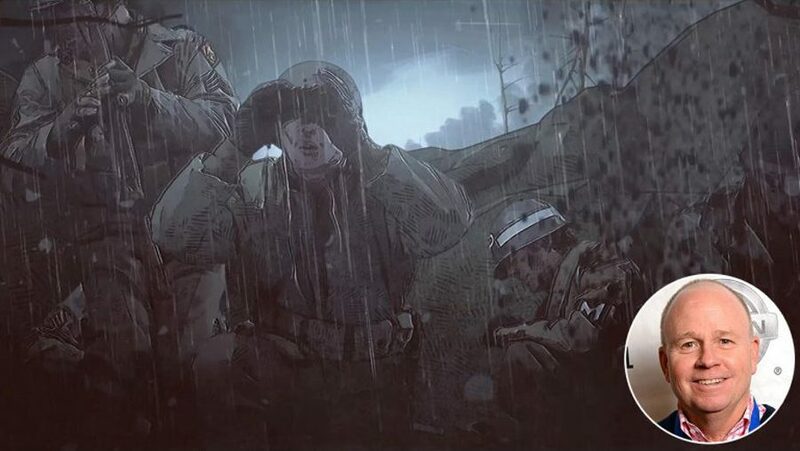 The story focuses on the U.S. Army Officer Felix Sparks and the 157th Infantry Regiment of Oklahoma, a National Guard unit that engaged in battle for over 500 consecutive days during the second World War. The Daily: What is “The Liberator” about? Stuart: The book “The Liberator” is about Felix Sparks. He was in charge of a rifle company of seven men in Oklahoma. Those men are cowboys and Native Americans and Mexican-Americans, and in Oklahoma in 1940 right before the war, none of those men could drink at the same bars because of segregation. It’s a really powerful story. I was really drawn to the story because it was a World War II story I had never heard of in terms of the diversity. The Daily: When did you start to write the show? Stuart: About five years ago, the book was brought to me by a producer, Michael Lynne, who used to be the head of New Line Cinema.They were trying to develop it as a series for A&E and The History Channel. I wrote it as an eight hour, six part miniseries. We scouted locations, we were all set to go—but then The History Channel decided it was too expensive to make. It’s a World War II drama, and these days you don’t have things like tanks and B-17s. About a year and a half ago, School of Humans, an animation studio, was approached to do a test of a type of animation called trioscope, which is a type of rotoscope animation. In rotoscope, you actually shoot live action and then, frame by frame, you draw over that. School of Humans was able to bring us all the good things we like about live action, but we could suddenly provide—through animation—things like tanks and fighter planes. The Daily: How did Netflix get ahold of the show? Stuart: Netflix is so big now. In Japan, they have their animation headquarters and the people over there who run that knew of trioscope and knew about the tests that School of Humans and A&E have done. A&E got the tests to Netflix and that’s how they showed up. The Daily: How does adapting a book differ from writing something original? Stuart: The interesting thing is it’s not that dissimilar. I’ve adapted a lot of things in my career and I’ve written a lot of originals and they’re just as hard. There’s not an advantage to adapting a book or a novel to a TV show or a film. You go through the same unbelievable nightmare that you go through when you’re writing something original because it changes so much. The Daily: When did you first start screenwriting? Stuart: I did a master’s at University of North Carolina at Chapel Hill in radio, television and film and I did another master’s at Stanford University in screenwriting. Then I did a year of postgraduate study in dramatic form at Stanford. Somewhere in those years of graduate school, I knew I wanted to be a screenwriter. I did not know a whole lot about movies until I went to graduate school. I really wanted to be a writer, but I just felt like screenwriting was a great place to be if you were a young writer. The Daily: What stories inspire you? Stuart: I’m motivated by stories that are difficult to tell. I like looking at ways to tell a story with multiple mysteries going on in it. “The Fugitive” was a story like that where there are different mysteries that are being solved by different characters. I like doing genre projects like “Die Hard” that are very different than what comes before that.